Brand new and high quality.Clear view at night.Support audio sound recording when working.2.7" full colors screen， Recording resolution can reach up t..
Support audio sound recording when working. 2.7" full colors screen， Recording resolution can reach up to 1080P at M-JPEG video format. Loop record function allows you to set the record time， With video output by USB cable to the PC. Supports up to 32GB TF card. Automatically starts when the car starts. Built-in battery supports long time recording. With G-sensor function. When the car crashes,the video file will be saved, whose name starts EVE,the file von't be deleted when cycle recording. Size:8.9cm x 4.8cm x 1.7cm - 3.50inch x 1.89inch x 0.67inch. Display: 2.7 Inch Lcd Screen. Optical format: 1/2M/3M pixel COMS. LENS: Wide angle view 120 degree. Video resolution: 1080P,720P30fps, WVGA, VGA. Video record format: M-JPEG, AVC1. File format: Video: AVI; Photo: JPEG. Video save interval: 1 min/2 min/3 min. Record loop: optional cyclic video recording. Record: Video record / Audio record. Playing: Video / Photo / Mp3. Memory card : TF Card up to 32GB (TF Card not included) . Power: USB power adapter, Built-in Battery. Carrier media: built-in memory(total:64MB) . 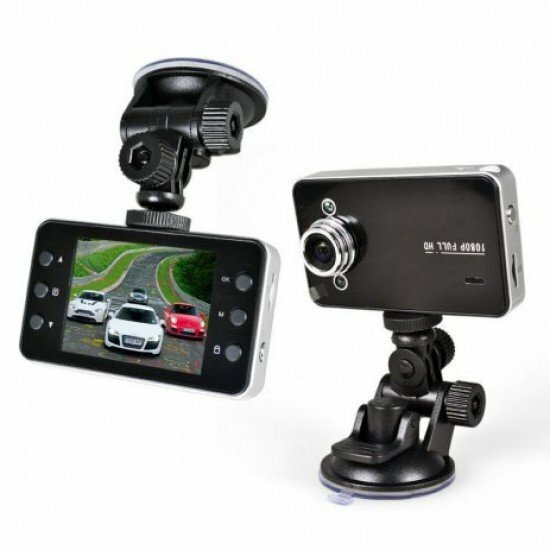 1x Car DVR road dash video camera recorder.